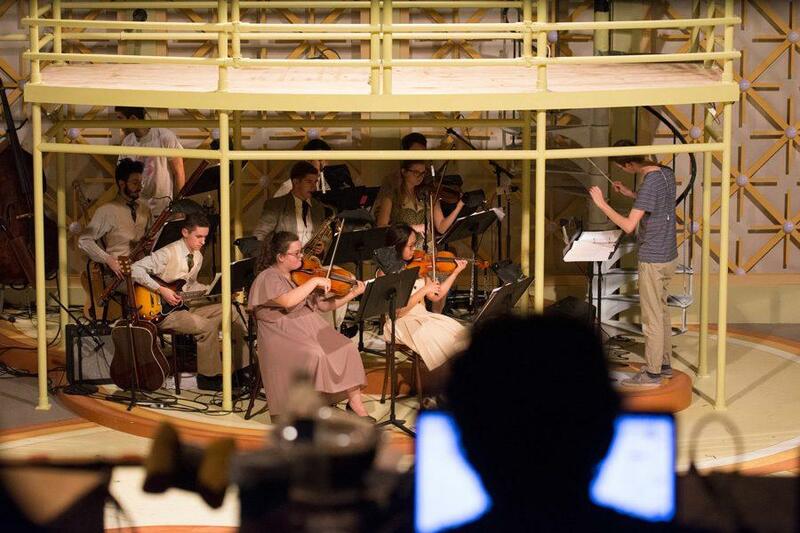 Musicians rehearse a piece from the upcoming musical “Sweet Charity.” The mainstage production, which opens in the Ethel M. Barber Theatre on Friday night, features the largest student orchestra ever found in the venue. With the largest student orchestra in the history of the Ethel M. Barber Theatre, an LED-lined set design and 1960s-inspired dance numbers, “Sweet Charity” is bringing a hybrid of jazz and classic musical theatre to the Northwestern mainstage. Directed and choreographed by Tommy Rapley, the adaptation of Bob Fosse’s 1966 musical opens Friday as the University’s second mainstage production this fall. Rapley, who said his career has largely been influenced by Fosse’s dance routines, described “Sweet Charity” as an opportunity to tackle a piece by one of his heroes. The play follows its female protagonist, Charity Valentine, as she navigates relationships with men while working at a dance club in 1960s New York City. Though seemingly naive, Valentine is eternally optimistic and an exciting character to portray, lead actress Jessie Jennison said. Jennison said the musical has been a dynamic experience both because of the character she plays, and also because of the technical aspects of the play itself, including the musical compositions that accompany the principal storyline. The production features an orchestra of 16 students. It also contains a variety of dance arrangements, which Rapley described as a “great little martini of movement” combining classical ballet and Fosse-esque jazz. Communication senior Eric Peters, who plays Valentine’s primary love interest, said it was a new and interesting experience for him to perform in a Fosse-inspired musical. Peters added that the overarching 1960s-inspired design is “incredible,” and helps evoke the era and world in which the musical is set. The light design of the production is especially rich, Rapley said, featuring a glowing back wall, individual twinkling bulbs and lights that glow from underneath the stage. Jennison said the show has been a great learning experience, both in helping her become more spontaneous on stage and in witnessing her character’s evolution, as she opens up to love and novel experiences.